One of the most beloved statues in Chicago is a pair of lion sculptures in front of the Art Institute of Chicago. Every time a Chicago sports team reaches the finals, the art museum puts the team’s hat/helmet on the lions. The Chicago Bears, Blackhawks, and White Sox all had hats/helmets. I believe lions even wore jerseys for the Chicago Bulls. 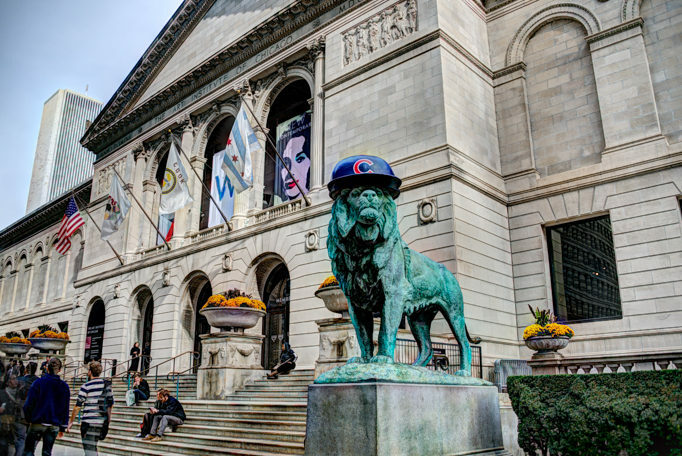 Since the Cubs haven’t been to the World Series in 71 years, the nation’s #1 art museum never had an opportunity to continue this tradition with the Chicago Cubs. 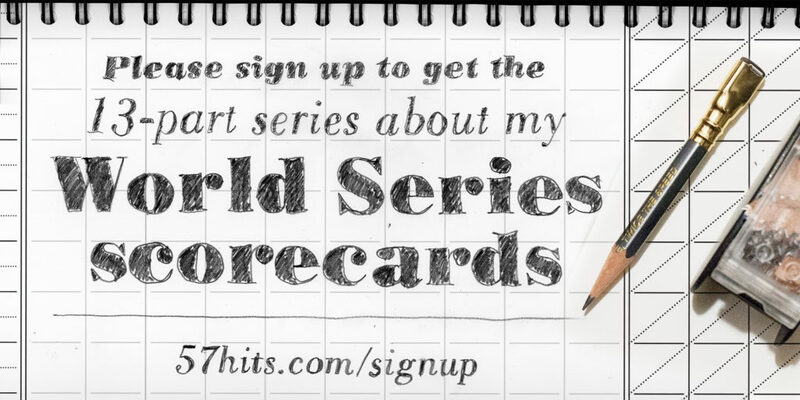 The Cubs were left out–until now! Since the Cubs are now in the 2016 World Series, the Art Institute made new hats for the lions. They are looking pretty nice! 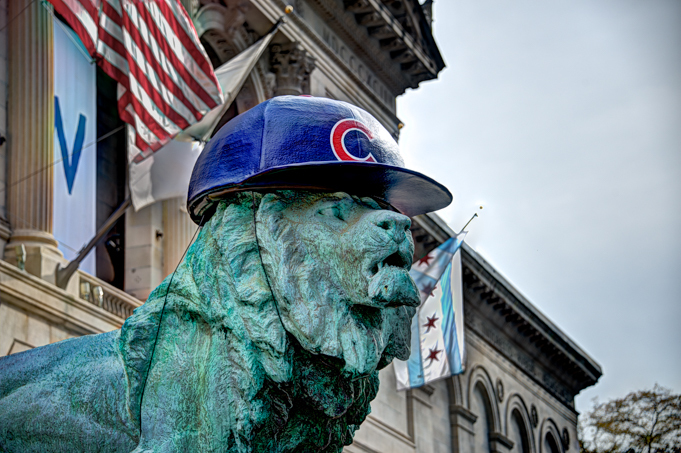 The Chicago flag, Cubs Win flag, and the American flag all fly behind the Art Institute lion in this picture. This is the north lion, “on the prowl”. 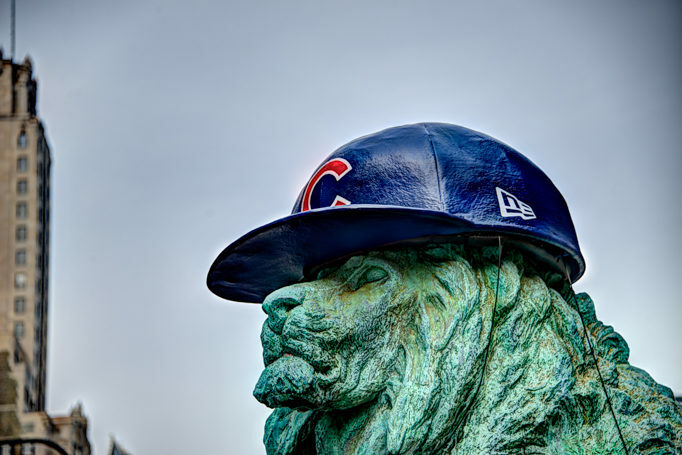 The south lion at the Art Institute lion is “in an attitude of defiance” while wearing his new Chicago Cubs hat. He’s rooting for the Cubs to win the 2016 World Series. Funny how the New Era logo is on the hat for the official MLB hat manufacturer. Where did this lion purchase his nifty jumbo-sized hat? What size would this hat be? a size 40-7/8? The Art Institute south lion stands in front of the entrance to the Art Institute of Chicago. During the 2016 World Series, the Art Institute also has banners up for Moholy-Nagy, and the Modern Wing. The W flag hangs in the center for the Cubs win. Well, they are also hanging this W flag when the Cubs lose too. Which exhibits in the Art Institute does this lion “on the defiance” like the most? 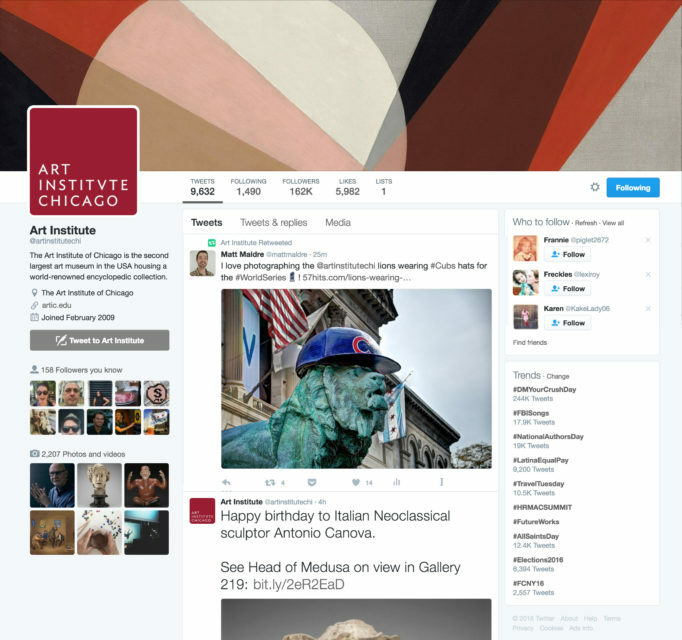 UPDATE: Always an honor to be retweeted by the Art Institute of Chicago! Matt, I’m the volunteer communications director for the Chicago Lakefront AYSO region. I’m wondering if we can use one of your lion images in social media (Twitter and Facebook). We will, of course, give you full credit and link to the page of your site of your choice. Do you have prints of Chicago Black Hawks and Chicago Bears Art Institute Lion, as well as Chicago Cubs?